If you're short on time, but hungry for adventure, Westwater is your place. 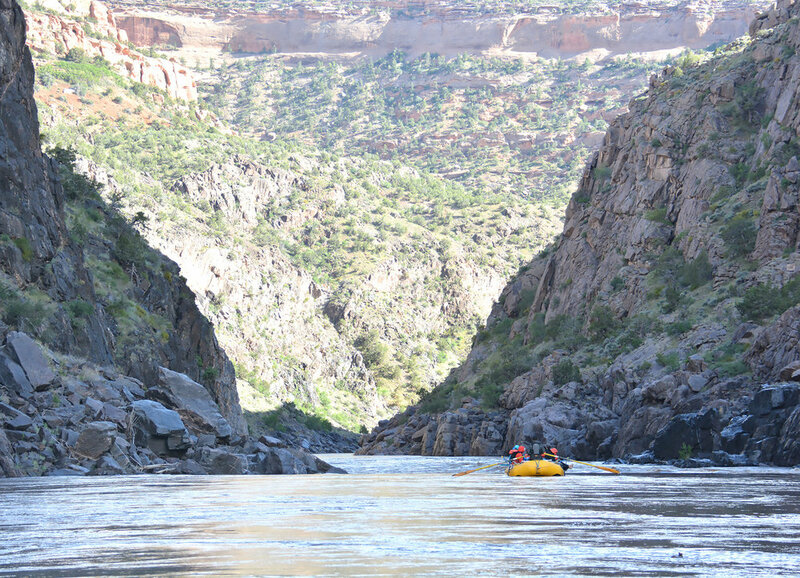 Generally run as a 2-day expedition, GOALS offers an extended experience in the canyon often referred to as "Westy" by launching further upstream than most and exploring the calm, tranquil waters of Ruby and Horsethief Canyons before entering the rapids and excitement of Westwater. 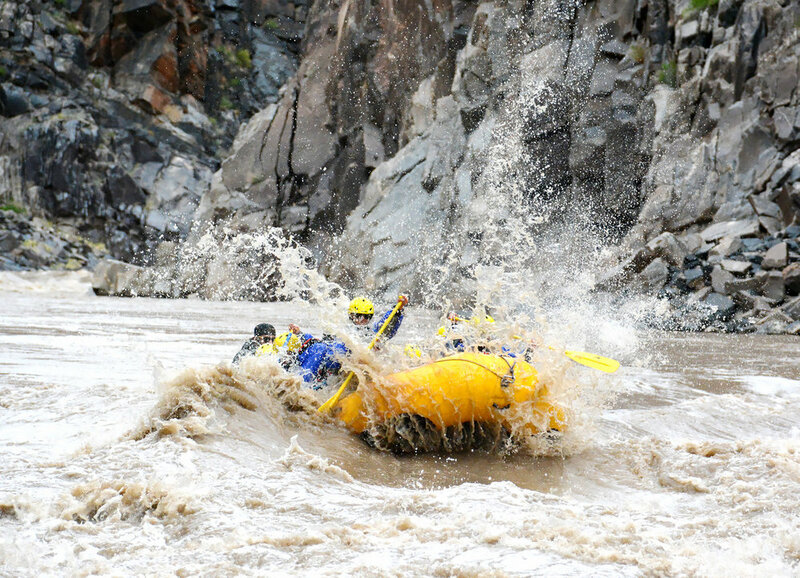 You'll get accustomed to "river life" on the first 2 days of your trip, enjoying time in rafts, inflatable kayaks, and perhaps even SUPs (stand-up paddle boards) - then you'll discover why National Geographic recently named Westwater Canyon the "World's Best Short Whitewater Trip" on days 3 and 4. 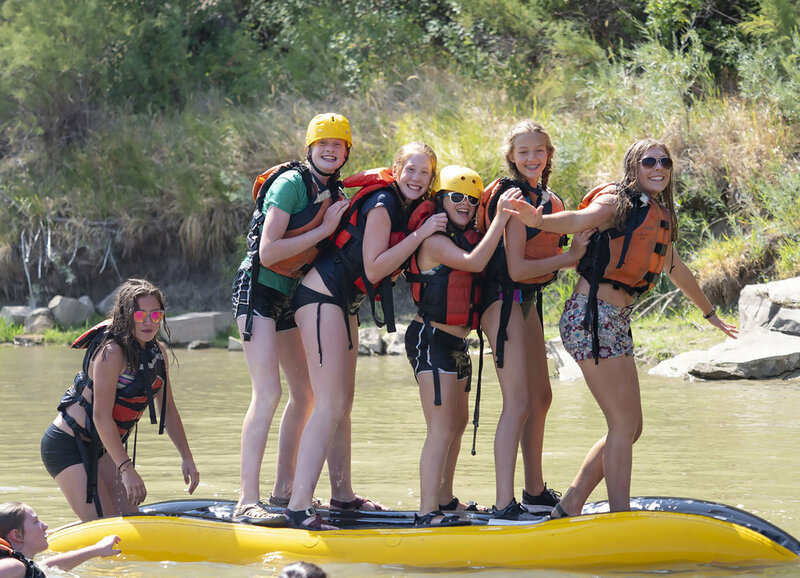 Aside from the excitement of rapids like Funnel Falls, Skull, Big Hummer, and Sock-It-To-Me, explorers in Westwater Canyon float past some unique history and geology that can only be viewed from the river. You'll take a short hike to the "outlaw cave" - a hideout used by famous outlaws of the west that still contains clothing, beds, tools, and other relics left behind by outlaws who used the cave to evade capture by lawmen. In addition, you'll lay eyes and hands on some of the oldest exposed rock on our planet, as the dark Vishnu Schist that forms much of the canyon walls is over 1.6 billion years old. You'll be in and out of Westwater before you know it - but the amount of excitement and exploration you've packed into 4 days will have you planning a return expedition before you even get to the take-out ramp! Day 2. Getting in the flow. After packing up camp and a thorough safety talk, we’ll meet the rest of our professional guide crew and launch onto the Colorado River to begin our adventure. Slowly, the canyon walls will grow taller as we head downstream in rafts, inflatable kayaks, and on SUP boards. When our bellies tell us it’s time, we’ll pull over and make a delicious riverside lunch. After eating, we’ll continue downstream toward our first night’s camp - most likely in the area of the Cottonwood and Mee camps. As we float, we’ll be watching for bald eagles, river otters, and desert bighorn sheep. When we arrive at tonight’s camp, we’ll break into teams, some of whom will help in the kitchen, some on the boats, and some with setting up the camp itself. Late afternoon is a great time for camp games or a quick swim in a river eddy next to our large beach campsite to cool down. The kitchen crew will help our guides prepare tonight’s dinner, then we’ll circle up in the “living room” around a campfire and re-call our favorite parts of the day, play a game or two that our guides teach us, and ultimately retire to our tents or outdoor sleeping area for a great night of sleep under the desert stars. The famous rapids of Westwater Canyon. Day 4. Entering Westwater. As we leave the Black Rocks section today, we’ll head toward “Bald Eagle Alley” and the end of Ruby Canyon before checking in at the Westwater Ranger Station and beginning the “second phase” of the expedition. Westwater Canyon will feel very different than Ruby - there’s a different energy here that’s more exciting and intriguing. Entering “Westy” mid-day, we’ll take a short hike to the old miner’s cabin and talk about Westwater’s storied history. Continuing downstream, the walls will feel a bit taller and the canyon will become narrower than it was upstream in Ruby. 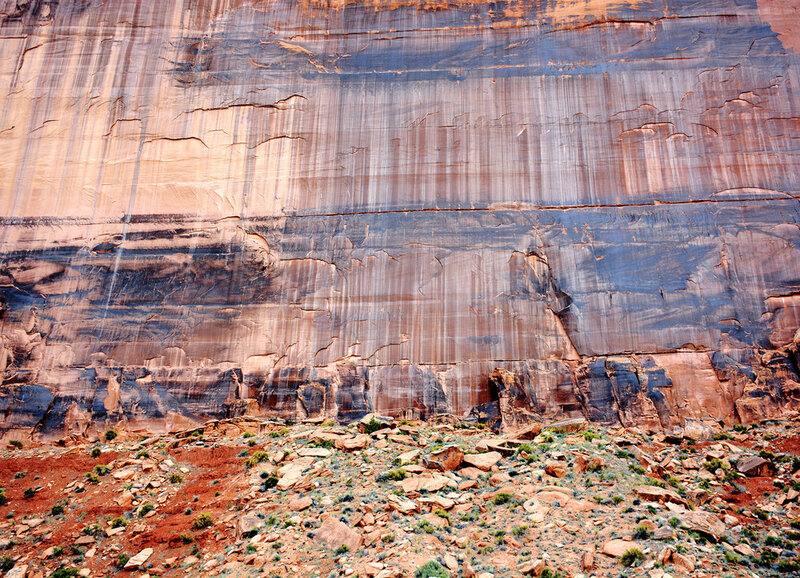 Walls come to life with beautiful streaked colors of “desert varnish” as we move toward the heart of the canyon and the rapids we’ve been excitedly anticipating for several days. This afternoon, we’ll navigate a few splashy and fun Class II and III- rapids, floating to a campsite just above where the significant whitewater begins, leaving the real excitement for tomorrow! Since this is our last night in the canyon, we’ll spend some time on a solo this evening composing a thank-you letter to the canyon - a GOALS tradition, then reflecting together on the growth we’ve experienced individually and collectively during our time here. One more night under the desert stars, and an incredibly fun day of whitewater tomorrow still lie ahead! Day 5. Rapids Day! Today is an exciting day - navigating the famous rapids of Westwater Canyon that include Funnel Falls, Skull, Sock-It-To-Me, Bowling Alley, and more. A nervous energy is often notable in camp this morning, as boats are rigged and rowed into the current. We’ll crash through big waves, row around huge boulders, then offer high-fives while hooting and hollering at the bottom of the rapids section. In between, we may hike to a cave where outlaws evaded law enforcement, and learn about the unique layers of geology in Westwater Canyon. By mid-afternoon, we’ll arrive at our take-out ramp near Cisco, UT - giving hugs to our guides after helping them load boats and gear onto trailers, and then we’ll head for home - generally arriving back to Evergreen, CO between 8-10pm. Transportation from GOALS world headquarters in Evergreen, CO to Loma, CO at the beginning of the expedition and from Cisco, UT back to Evergreen, CO after the expedition. ALL MEALS - from dinner on day 1 through dinner on day 5. This includes all meals on the road and in the canyon (4B, 4L, 5D) - and accounts for all dietary restrictions and preferences. No need to send kids with road money for anything other than snacks. Campsite at Highline State Park in Loma, CO on night 1. All launch fees and government use fees for Ruby and Westwater Canyon.